The Northland region is a place of discovery, with stunning coastal and forest scenery, fascinating history, remote beaches and some of New Zealand’s best-kept secrets. The Twin Coast Discovery Highway is an ideal way to explore the fascinating region. On the main route north you can snorkel in the marine reserve at Goat Island, visit the Clock Museum at Whangarei, take a thrilling ride to explore the world’s largest sea cave at Tutukaka and see the renowned Hundertwasser toilets at Kawakawa. In Bay of Islands learn about the birth of a nation as the Treaty of Waitangi, our nation’s founding document, was signed between the Maori peoples and the British Crown in 1840. Visit the Treaty House and experience a sound and light show telling the story of the area from the coming of Kupe -the first Maori to discover this land - to the present day. Trace the bullet holes in the walls of Christ’s Church in quaint and historical Russell, formerly New Zealand’s first capital. On the water you can cruise through the famed Hole in the Rock, swim with the dolphins or spend a day in the Bay on a tall ship. 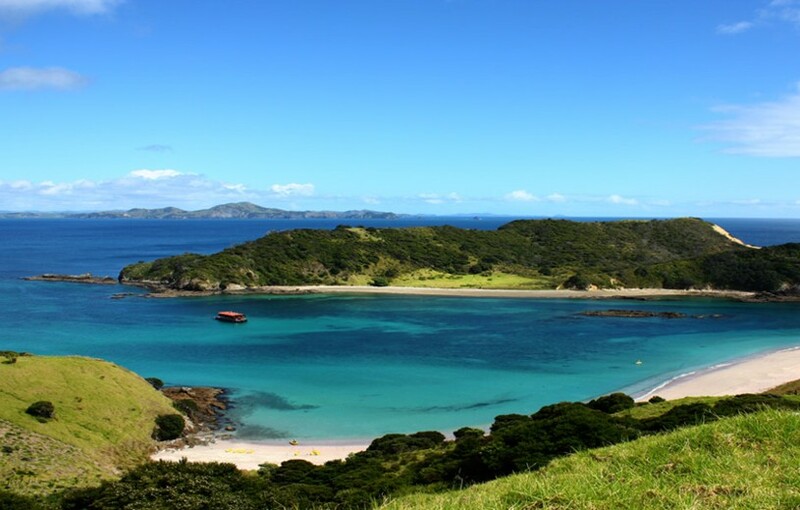 The famed fishing and scuba diving around Paihia and the Poor Knights Islands is world-class. Relax at any one of a number of beaches, especially those around Doubtless Bay. Take a bus trip along 90 Mile Beach to visit the lighthouse at Cape Reinga and see where the Tasman Sea meets the Pacific Ocean. The more remote West Coast route takes you through the Waipoua Kauri Forest where you can visit Tane Mahuta, one of the largest trees in the world. The Hokianga harbour is Northland’s quiet jewel, where you can see Kiwi in the wild at night, ride the sand dunes in a buggy or on horse back, cruise the harbour or go surfing. Learn about shipwrecks at Dargaville’s Maritime Museum and the gumfields at Matakohe’s excellent Kauri Museum.